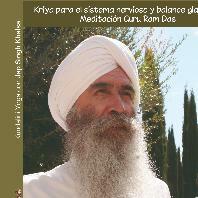 Currently in Saltillo, Mexico, Kalyan has been a Kundalini Yoga teacher since 1996. 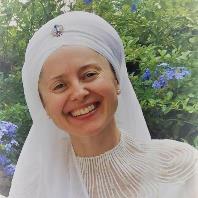 She shares Yogi Bhajan's teachings in many training programs in Mexico since 2004, yoga classes and workshops. She formed a small yogic community in Binghamton, NY which is very dear to her heart, as are all of her students and colleagues around the world. She is also a licensed Conscious Pregnancy Trainer and teaches both in Spanish and English. 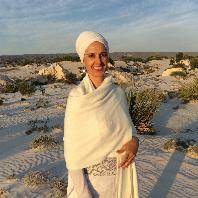 Upon getting her PhD in Art History in 2010, Kalyan is invested in joining the areas of Art History and Kundalini Yoga in a continuous space for exploration and growth expressed at www.waheguruyoga.com.mx. She hopes men and women will reach out and connect in their spirituality as loving, critical and balanced human beings. She teaches kundalini and pregnancy yoga at Avemed in Saltillo and chants kirtan with her husband musician and KY trainer Jap Singh Khalsa.